There are some people who seem to go through life with a follow-spot on them, a bright light that makes them stand out from the crowd. Rebekah Simon-Peter is one of those people. I met her at a Hashivenu Conference to which she had been invited, and can attest to her energy, her charisma, and the bright light that seems to emanate from her. A dynamic individual. 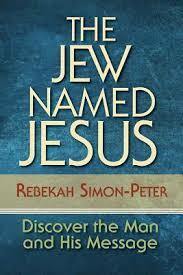 Her book, The Jew Named Jesus: Discover the Man and His Message, is not only about Jesus, it is also about her. The book is fast moving, brief, well written, and biographical. Each of its six chapters except that last is framed as a question. The first chapter, and thus the first question is this: “What’s a Nice Jewish Girl Like Me Doing in a Place Like This?” Simon-Peter tells of being raised a Reform Jew, with a Jewish mother and a Roman Catholic father, of a transformative trip to Israel at age twenty-four after which returned and investigated and then embraced Orthodox Judaism, marrying someone like herself, a Ba’al Teshuvah, another Jew who had returned to Orthodox observance. When she was twenty-nine she had a transformative and unsought vision of Jesus that reset the gravitational center of her life, resulting in a divorce, and her reluctant investigation of all this Jesus stuff, which she did in her typically intense manner, going off to study at Iliff School of Theology, in Denver, Colorado. Although attracted to Jesus, she was not at all at home in the church, finding it so different from her Jewish experience and predilections, and she found the Apostle Paul especially off-putting. But she stayed at the seminary learning what she could, until God again disrupted her life by calling her into ministry—church ministry. After fifteen years in various kinds of pastoral roles, beginning with a black United Methodist church, she then began her own consultancy/coaching/teaching ministry, which is the context in which she has written a number of books, including this one. Her current name is not her birth name. She explains in the book why and how she chose it, and having read her explanation, it makes sense. She shows how Jesus followed the Pharisaical practice of “building a fence around the Law,” which she terms establishing behavioral boundaries, as when he taught that avoiding nursing anger is a necessary precondition to violating “thou shalt not kill,” and avoiding lust as a precondition to avoiding “thou shalt not commit adultery.” Her message throughout is to correct the church’s habit of negatively contrasting the Judaism of Jesus’ day with his practice, and to call attention to what is obvious in the pages of the Newer Testament: continuity and context. Chapter Four asks and answers, “Did the Jews Kill Jesus?” She begins by discussing Mel Gibson’s movie, “The Passion of the Christ,” and how she could not bring herself to see it, sensing that the portrayal of the Jewish people would greatly trouble her. I commend her judgment: I saw the movie and found it profoundly disturbing, as it presented the Jewish leaders of Jesus’ day as nothing more than a religious Mafia, their religion a sham, all the people of Jerusalem with few exceptions a blood-thirsty mob, and the apostolic band divorced from Jewish life. It was and remains a profoundly disturbing movie, which did only one thing well: it made one feel the horror of crucifixion. Jesus offered himself knowingly and willingly. Jesus died in accordance with the will of God. It was the Jews’ fault. Limited liability – Saying that all the Jews are responsible for the death of Jesus is like holding all whites responsible for the death of Dr. Martin Luther King. Preposterous! Forgiveness – Yes, some Jews were involved in the death of Jesus, but God used this for the good of all, providing salvation for all humankind, and besides He stands for love and forgiveness as should Christians. Questionable evidence, which she terms “What is Truth?” – Simon-Peter suggests that since the evidence of the gospels seems contradictory and of dubious historical value, we can just agree that there are no grounds for fighting over facts which are not exactly in evidence. The timing of the trial [actually there were SIX trials]. If Jesus was taken to the High Priest late Passover night, or early the next morning, this was a violation of Jewish law. In fact, scholars have identified 27 such irregularities in the trial. She suggests that people so concerned about Yeshua’s violation of Torah would hardly be likely to conduct a trial where halachic standards were so trampled upon. Here I think she gives inadequate attention to the possibility that this was a kangaroo court. The divergent testimony of the witnesses—this would have voided the verdict of the trial. The alleged custom of releasing a prisoner at Passover time, resulting in the release of Barabbas. There is no evidence that this custom existed. Besides, the name “Barabbas” means “son of a father” which is too tidy a parallel to Jesus “the Son of the Father.” In some sources, in fact, Barabbas is called “Jesus Barabbas.” It seems more likely that he is a made up literary device. It is just too neat. Pilate – She suggests that Pilate is presented as too sensitive and unwilling a party in the execution of Jesus. Historically, he was known as outstandingly bloodthirsty and cruel, and as despising the populace of Jerusalem. His conduct in the gospels is completely at variance with any historical portrait we have of him. Crucifixion – This was a Roman form of humiliating torture and death. That Jesus died this way indicates that he died for offenses against Roman, not Jewish law. With all of these factors in place, Simon-Peter holds that there are no suitable grounds for argumentation about Jewish culpability in the death of Christ. Bottom line: it’s complicated. We’ll never know for sure. But this we can know. The suffering, death, and resurrection of Jesus are absolutely vital for Christians. He died for the sins of the world. His saving death has brought hope, love, and forgiveness to billions of people worldwide. Here’s where I stand: holding this event sacred while treating it with sensitivity is important for keeping the love alive while letting anti-Semitism die. She closes the chapter by highlighting how “the times they are a-changing,” as Christians have reconsidered old opinions about the Jews, most notably on the heels of Vatican II, and Jews have begun to see Jesus as one of our own. She suggests we should keep this process moving forward. [Being chosen means] to be in covenantal relationship with God. It means serving God in bringing the world to the knowledge of the one God. Finally, it means living in such a way that the world is perfected under the rule of God; it’s brokenness repaired (tikkun olam). A subsection of this chapter examines supersessionism, asking and answering the question, “Has the Church Taken Israel’s Place as the Chosen People?” Her response is a resounding “No.” In fact, the New Covenant passage in Jeremiah, far from abolishing Israel’s covenantal status, promises a renewal of that status, entailing Spirit-empowered Torah faithfulness. Yet most Christians imagine Israel to be “bumped, expired, obsolete.” Not knowing other readings of the data, she assumes that the Letter to the Hebrews is a supersessions document, and more than once in her book sees biblical authors at sharp variance with each other. This is not an interpretation of the data that I favor. I believe she, like most Christians, misinterprets Hebrews and its message on matters of Israel, its cult, and covenant. She needs to read Charles P. Anderson on the subject, and read Richard B. Hays’ retraction of his former supersessionist views as inspired by Anderson. She also examines the Apostle Paul, whom she never liked or trusted. It was only when she read N. T. Wright, Mark Nanos, and Pamela Eisenbaum that she began to see Paul in a new light, as a loyal and Torah observant Jew, whose negative comments about Torah were directed to Gentiles whom he was reminding that they did not need to become Jews, and thus Torah observant, in order to fully please God. Both Nanos and Eisenbaum are Jewish New Testament scholars who see Paul in a Jewish light, and Eisenbaum teaches at Iliff School of Theology where Rebekah attended. She says that reading Eisenbaum and Nanos has left her heart, like Wesley’s, “strangely warmed” toward Paul and the Letter to the Romans. Now she sees Paul as the Apostle to the Gentiles, who used both Jewish midrashic approaches to Scripture and Greco-Roman diatribe, a dramatic approach to organizing text, which creates imagined proponents of antagonistic views differing with each other. Paul’s harshest language needs to be seen in this light: as part of a dramatic posturing rather than a declaration of personal convictions. She sees Paul as convinced that with the resurrection of Jesus the Age to come has begun, a resurrection that Wright reminds us is physical and communal. Rather than declaring Judaism null and void, he affirms the Jewish people, Jewish God, the Jewish Torah, and the Jewish way of life. At the same time, he affirms the inherent value of Gentiles and their rightful place in the world to come. Most of all he affirms that the one God is God of all people. And that all can be one in God. Go all the way: renounce the tradition of making odious comparisons. See Jesus not as the anti-Jew or the former Jew but as the epitome of what Jews strive to be, as the Living Torah. Abandon polarization and us them thinking. Refocus on the Kingdom of God. We live in a day when the entire message is personalized, individualized, and simply about Jesus, Jesus, Jesus. But this was not the message he and his apostles taught. He is interested in global transformation, in the transformation of life as we know it. Seek a new heaven and a new earth in which righteousness dwells and all peoples dwell in diversity and mutual respect and joy. Start building and working toward such a world. She calls the church to accept the fact that Jesus-believing Jews are Jews and that we are here to stay. She asks the church to come to terms with this reality, and for all to work together toward the peace the prophets envisioned. The book ends with an excellent Appendix of discussion questions about each chapter. These contribute to making this an excellent tool for working with Church people, and also with Jews, to promote greater understanding and cooperation. Both the Appendix and the book itself are well-crafted tools, obviously the work of a practitioner rather than a theoretician. My chief concerns about the book are these. She is quite ready to pit one Bible book against another, assuming underlying differences without adequately seeking for or entertaining an underlying continuity. This will disturb theologically conservative readers. She more than once quotes from John Dominic Crossan, a Newer Testamental scholar who is generally viewed as very far left. His views on the integrity of Scripture are far below the standards entertained by people in the Messianic Jewish movement, and this will make her harder to sell to them and harder to read and accept. She almost seems to limit the gospel of Yeshua the Messiah to being a message for the Gentiles. She fails to address and explore what the Jewish response to this gospel should be today. This seems to me a weakness of the text. Nevertheless, this is a very well written book. There is much clear thought here, and no flab. It is well worth a good reading, and should be useful to many as a manual for discussion groups in a variety of contexts who seek to understand the Jewish/Christian reality and to cooperate more fully with God. Well done. I myself do not see why reliance on much of the historical data by liberal scholars is a problem. I think we need to understand that many scholars see themselves as historians first and foremost and while we may disagree on many of the conclusions, it is hard to do high degrees of study in the world of New Testament scholarship without using the resources of people we would not share theological conclusions with. As I heard one recent evangelical scholar say, with many liberal scholars we will find we may agree with the majority of what they say, Let us say we agree with 80%. Do we then jettison everything because we disagree with 20%? If I have invested much graduate level study in learning from people like Dr. Crossan, why can’t this be acknowledged? I agree that there is often something to learn from such scholars. Pirkei Avot in the Mishna advises us wisely, “Who is wise? He who learns from everyone.” My comment in the blog post was that in the MJ Movement which is almost entirely quite conservative, someone like he is a stigmatized voice. People DO tend to prefer listening to their favorite voices, as is true also in the realm of politics. I know at least one hard Left Liberal who cannot see any truth at all in anything said by someone on the Right, and the same is true for some on the other side of the aisle. Again, your comment is wise, and I believe it to be a sign of maturity to be able to discern good from evil, truth from falsehood, and to take the fish and throw away the bones. Finally, one will find in theological academia that a wide range of scholars will have wide ranging fundamental agreement despite the positions they are obliged to emphasize due to the “camps” with which they are associated.